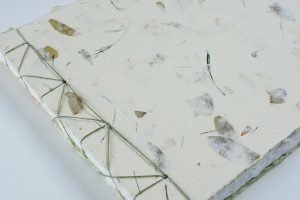 I created a tutorial to make this set of three notebooks with handmade paper covers. They would make a really nice gift for both men and women or a favor at an event. I used the papers from the May 2018 Paper Club, but you could use any heavyweight handmade paper or card stock for this project. If you use machine made paper for the cover, make sure the grain runs parallel to the spine of the book. 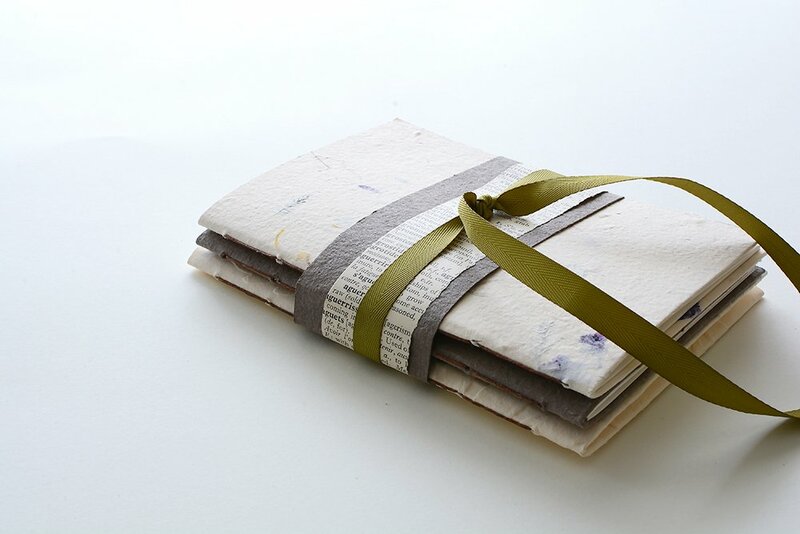 The notebooks are sewn using one of the easiest and most versatile stitches, 5-Hole Pamphlet Stitch. It can used on its own to make nice notebooks, but also combined with other structures, such as accordion or concertina bindings. If you are making a smaller book, you could use 3 holes or 7 holes if you wanted to make a bigger book. Enjoy the project and post any comments or questions below or in the Facebook group. Thank you for the tutorial – like the inside pocket. A wonderful tutorial! Thank you. Great tutorial! Thank you for taking the time to be so clear and thorough. Yes LOVE the pocket too!! This is so simple but so nice. Thanks for the great tutorial. Thank you. Yes, great idea with the pocket! Thanks for sharing your knowledge. Your tutorial is very clear. Now I’m off to try my hand at making these. Great tutorial, as always, Ali! Thank you so much for sharing. Explicit directions make it so easy to follow. Your videos are wonderful! Full of tips and hints and well photographed besides.